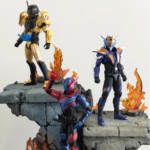 The start of Kamen Rider Zi-O is right around the corner, and the new Rider Kicks Figure has many collectors excited. 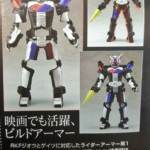 Thanks to some magazine scans, we have our first look at the Rider Kicks Figure Build Armor Time. On its own, the RKS Armor Time Build doesn’t look like he has much going for it aside from some very limited elbow and knee joints. 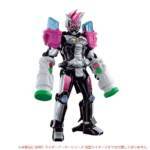 Other than that, it appears to be a hollow shell that you then attach to either Kamen Rider Zi-O or Geiz akin to the Level 1 forms from Ex-Aid’s gimmick line. None the less, you can look forward to seeing this dropping in September, retailing for 1944 yen.